I work at - brace yourselves - a chain bookstore. Yes, it is big and well stocked and we have a used book department which is joyful and good. I have certain regular customers that I know by name or on sight. It still isn't the same as an independant store (which, by the bye, I still shop at! Long live Baileywick Books and Books of Wonder!). We have some pretty cool booksellers. Our store manager is a self-professed Book Geek. All in all, could be worse. Today, I was wheeling a cart of audio books (among other things, a full dozen copies of 'Jonathan Starnge & Mr. Norrell on CD - UNABRIDGED, which means HUGE. Why, I ask you?) past the teen fiction section. I noticed a woman browsing and, since I'm a nosy sort, I asked if she needed any help. "Actually, yes," she replied. Apparently, the entire family loves reading. Big YAY! right there. She was looking for books for her four kids: daughter, aged 16, and sons aged 14, 12 and 11. Daughter has been reading PD, sons all liked HP, one loves LOTR... you get the idea. Well, I didn't realize until later how fast I was talking. Honestly, I must've sounded like I'd just downed a few espressos. I just got so excited... For the daughter, I gave her 'Teen Idol.' Apparently she loves reading stories set in schools, so that was perfect. I also sold her the first 1-800-WHERE-ARE-YOU, and gave her a printout of the Mediator titles (as they're being reprinted with new covers and Meg Cabot as the author (rather than Jenny Carroll) come the end of December). Youngest son: 'The Dark is Rising.' I told her the gist of the story, and confessed that I reread it at least every other year (and that I got at least one person hooked on it this summer!). And, if he likes it, he has four more books to enjoy. Middle son: 'Airborn' by Kenneth Oppel. Just a heads up, if you haven't read it, you really should. It's an alternate earth story, one in which trans-oceanic voyages are made in zeppelins. It's the story of a cabin boy on a luxury zeppelin, the daughter of a famous explorer, and what lies in the unexplored regions of the sky. Fantastic. In every sense of the word. Older son (and LOTR addict): the Fionavar Tapestry by Guy Gavriel Kay. What more can I say? The customer was delighted, and didn't seem alarmed by my babbling. She asked my name; when I told her, I assured her she could always seek me out for more recommendations. She bought EVERY SINGLE THING I suggested. I got to sell books I love to a mom who is taking them to kids who love to read. This is when my job is really, really good. 20 are not afraid | are you afraid? I officially love you. You recommended the 1-800 series? I ADORE that series. Best of all Meg Cabot's books, IMO. I've been selling that one a lot lately. Maybe because my NaNo is a bit influenced by it. I think the Mediator books still edge out over this series, for me. Only very,very slightly. That may change. Is there going to be another 1-800 book? I like the Mediator books, too, but there's something about Jess Mastriani that just speaks to me, lol. She's just...awesome. And I think Meg Cabot is writing another 1-800 book, which makes me very, very happy. That is awesome awesome awesome AWESOME! Oh, it was sheer joy. I mean it. I was riding that high for the next three hours. *clings* Wanna come work with YOU. While I am a mere bookseller and have no real power, I bet if I said, "you should really hire her; I know her" they would do it. Even more so if I just said "She's another me." Oh, and I saw two houses (apartments?) for rent on Brady Rd, closer to town, yesterday. Ooooh. Hey, what's the name of your town's newspaper? The Times Herald Record serves the area. Yay for bibliophiles (I *think* that's the right word...) and people who listen to Mari's excellent advice! ..this kinda makes me want to work in a real B&N, as opposed to the college store I worked at this year and last. Do you want the US covers, dearling? They're boring but inoffensive. And I don't know that they'll be rereleasing them anytime soon. I want the 1-800 ones that match these. Exchange Rate is wonderful at present, I ought to throw an order at Amazon before A) it changes and B) I spend all my money on Christmas. Oof. Those are way better than what we have. And I don't much like the covers on the reprints of the Mediator books. Just to give you an idea. Ick. My mediator books are pretty good too - I have books one through four in this sequence. And the 1-800 ones I'm missing two of. And am now perusing Amazon. Those have not yet made an appearance in my bookstore. Miscovering of books should be a legal offense. Though I'm delighted that they're coming out again. 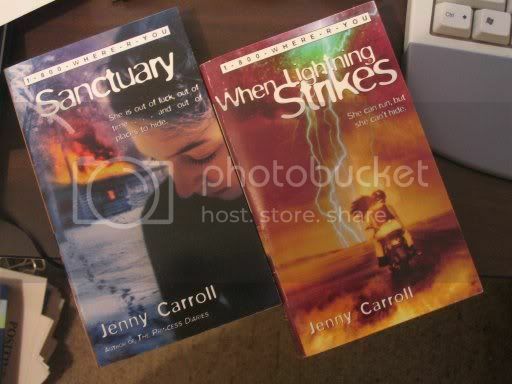 They're my favorite Meg books. I don't know if they are still around or not, but when i was young, i couldn't get enough of the Tom Swift books. they are for the same age group as the Hardy Boys and Nancy Drew. The were my first exposure to science fiction and probably had strong influence on my becoming and Engineer. If they are stiil in print they are a good recomendation for young boys. Speaking as another *gasp* Chain Bookstore Employee, I can totally see where you're coming from. I nearly spit milk on the screen when you mentioned how fast you were talking. I do the EXACT same thing. I've also been known to squeak, jump up and down, and tug customer's coatsleeves in excitement. I sold a woman five books yesterday when she only asked for one, because I gave her a high-speed, half-hyperventilated sales pitch for all of them then left her to choose. She couldn't pick one, so she bought them all. I've never been so proud of myself. Loved the Fionavar tapestry- also the Tad Williams Dragonbone Chair series was great- then he got all kaflooey with Otherland. Let me take this opportunity to tell you that just READING the words "Fionavar Tapestry" make me want to cry. I still owe you a million for making me read those. That airborne book looks good. I should get it... wish I had more time to read.